SYNTHA-6 is regarded as BSN’s 3 proprietary protein blends and growing fast in popularity due to its great flavours and amount of cool features. Fuel muscle tissue and your body with the nutrients they have to excel in muscle growth, recovery, strength, and weight management by choosing SYNTHA-6 by BSN. It works to increase lean muscle tissue. Aids in recovery time after workouts. It enhances cardiovascular function, a great mixture of several proteins. SYNTHA-6 gets its name from the 6 different protein and amino acid sources used since the first step toward this protein: Whey Protein Concentrate, Micellar Alpha-and-Beta Caseins and Caseinates, Whey Protein Isolate, Egg Albumen, Calcium Caseinate and Milk Protein Concentrate. Each one of these protein sources has unique benefits so having all of them in one single product is ideal. By combining fast releasing whey proteins with slower releasing egg and casein proteins, you will get a reliable sustained delivery of protein to parts of your muscles. It is better than large doses of whey protein which absorb quickly, so quickly that it may not all be used. SYNTHA-6 does contain substantial levels of whey protein but the existence of other, slower-releasing proteins mean that you will not need or want another protein shake in just an hour or so of your whey shake. BSN prides itself on making its protein powder, Syntha-6, with a mixture of 6 different proteins, as well as amino acids. Of note would be the fact that the product does contain artificial sweeteners, flavouring, and colours, which might be considered a bad by some consumers. Whey Protein Concentrate, Whey Protein Isolate, Calcium Casein, Micellar Casein, Milk Protein, Egg Protein, Glutamine Peptides, Sunflower Powder, Polydextrose, Natural and Artificial Flavors, Medium Chain Triglyceride Powder Sucralose, Potassium, and Yellow #5. 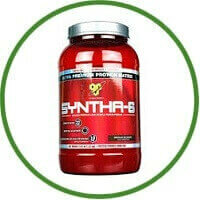 According to BSN Syntha-6 have several benefits over other similar protein powders. 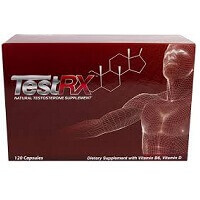 These generally include: assisting to increase lean muscle tissue, Aiding in recovery time after workouts, increasing energy, Increasing endurance, Enhancing cardiovascular function, a great mixture of several proteins, and No digestive negative effects. It’s available in several nice tasting flavours such as: Strawberry Milkshake, Vanilla Ice Cream, Chocolate Peanut Butter, Mocha chino, Banana, Caramel Latte, Chocolate Milkshake, Chocolate Mint, and Cookies and Cream. BSN breaks the dosage for Syntha-6 on to two categories: men and women. It is BSN’s belief that in line with the makeup of women’s bodies versus men’s bodies that ladies require less protein supplementation than men- even though ladies are working out every day and incorporating strength training to their routine. The next dosages are recommended by BSN. Men should use two scoops of this protein powder blended with 8-10 ounces of water or skim milk. You can easily take the product 2-4 times per day or as frequently as you feel is important for you yourself to achieve your goals. Women should use one scoop regarding the protein powder blended with 4-5 ounces of water or skim milk. Women may also use Syntha-6 2-4 times a day or as frequently because they feel is essential. Fuel muscle tissue and your body with the nutrients they have to excel in muscle growth, recovery, strength, and weight management, choose SYNTHA-6 by BSN.